A GtkListBox is a vertical container that contains GtkListBoxRow children. These rows can by dynamically sorted and filtered, and headers can be added dynamically depending on the row content. It also allows keyboard and mouse navigation and selection like a typical list. Although a ListBox must have only ListBoxRow children you can add any kind of widget to it via add, and a ListBoxRow widget will automatically be inserted between the list and the widget. ListBoxRows can be marked as activatable or selectable. If a row is activatable, row_activated will be emitted for it when the user tries to activate it. If it is selectable, the row will be marked as selected when the user tries to select it. istBox uses a single CSS node named list. 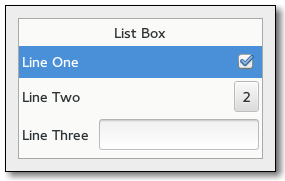 Each GtkListBoxRow uses a single CSS node named row. The row nodes get the .activatable style class added when appropriate. This is a helper function for implementing DnD onto a ListBox. If a row has previously been highlighted via drag_highlight_row it will have the highlight removed. Gets the n-th child in the list (not counting headers). Insert the child into the this at position. Update the filtering for all rows. Update the separators for all rows. Update the sorting for all rows. Prepend a widget to the list. Sets the adjustment (if any) that the widget uses to for vertical scrolling. By setting a filter function on the this one can decide dynamically which of the rows to show. By setting a header function on the this one can dynamically add headers in front of rows, depending on the contents of the row and its position in the list. Sets how selection works in the listbox. By setting a sort function on the this one can dynamically reorder the rows of the list, based on the contents of the rows. Unselects a single row of this, if the selection mode allows it. The row_activated signal is emitted when a row has been activated by the user. The row_selected signal is emitted when a new row is selected, or (with a null row) when the selection is cleared. The select_all signal is a keybinding signal which gets emitted to select all children of the box, if the selection mode permits it. The selected_rows_changed signal is emitted when the set of selected rows changes. The unselect_all signal is a keybinding signal which gets emitted to unselect all children of the box, if the selection mode permits it.